The popular herbicide Roundup is linked to non-Hodgkin's lymphoma. Farmers and gardeners suffering from the disease are filing lawsuits against the company. Description: Monsanto’s Roundup, the most common weed killer in the world, has been shown to cause cancer. Farmers who used Roundup regularly have been diagnosed with non-Hodgkin’s lymphoma. While the company continues to misinform government agencies and the public about the product’s safety, suffering Roundup users are filing lawsuits against Monsanto. Monsanto’s Roundup herbicide is the most applied weed-killer in the world. It is predominately made with glyphosate, the most-used agricultural chemical ever. Nearly 300 million pounds of glyphosate are used on crops worldwide each year. Roundup is “probably carcinogenic,” says the International Agency for Research on Cancer. Roundup has been linked to lymphatic cancers like non-Hodgkin’s lymphoma among agricultural laborers and gardeners. Monsanto faces approximately several thousand lawsuits in federal and state courts over the herbicide. In August 2018, a San Francisco jury issued the first such Roundup verdict. They awarded Dewayne Johnson, a former groundskeeper diagnosed with non-Hodgkin’s lymphoma, $289 million in damages. If you or a loved one contracted non-Hogkin’s lymphoma after using Roundup, please contact us for a free, no-obligation legal consultation. You pay nothing unless we recover for you. Even before glyphosate research emerged, Monsanto didn’t have a glowing reputation. The agricultural company manufactured Agent Orange during the Vietnam war and the environmentally harmful insulation chemical PCB until the 1980s. Monsanto started selling glyphosate in the 1970s. Its popularity, however, emerged alongside the introduction of genetically modified crops (GMOs) in the late 1990s, which were designed to resist glyphosate. Through these “Roundup Ready” seeds, Monsanto has been able to control the agricultural industry, cementing glyphosate within the larger GMO debate. The company faces critics and lawsuits worldwide. In 2013, annual March Against Monsanto events started to protest glyphosate and GMOs—400 marches across 40 countries happened for the 2015 event alone. Monsanto’s reputation is so damaged that after their proposed merger with Bayer was announced in September 2016 (a union that would make it the largest agrochemical company in the world), there were discussions that the German company would drop the Monsanto name in an attempt to save its brand. Glyphosate is an herbicide that targets a particular enzyme that is responsible for plant growth. Monsanto’s genetically modified seeds are resistant to its effects, causing only the weeds to die in its wake. They allege that the chemical is safe because this enzyme is only found in plants—not in humans nor animals. Because the chemical has been used widely for 40 years, though, it has led to the creation of glyphosate-resistant superweeds. To date, as many has 263 glyphosate-resistant species have been reported around the world. In order to kill these unwanted plants, even stronger herbicides must be used on crops. Worldwide, glyphosate use is increasing. Seventy-five percent of all glyphosate sprayed since the 1970s occurred in the last 10 years alone. Though some countries are starting to restrict its use, these statistics suggest that glyphosate’s effects on environmental and human health will be present for years to come. The spike in glyphosate use makes the chemical almost impossible to avoid, even for those who don’t directly handle Roundup. Traces of glyphosate have been found in oatmeal, honey, wine, and even baby food. What’s more, even those who try to minimize their exposure by purchasing organic products are still at risk. Runoff from Roundup crops feed glyphosate into neighboring streams and rivers; animals, too, have been discovered to carry traces of glyphosate, making it a difficult chemical to contain. In a study conducted by the Detox Project, 93 percent of volunteer test participants had traces of glyphosate in their bodies. Even more scary, children reported higher percentages of the chemical on average. 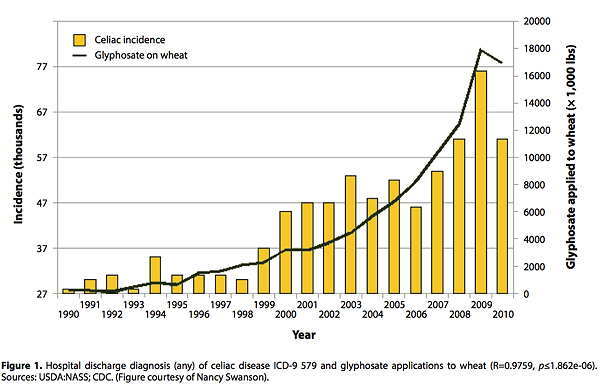 Correlation between celiac disease and glyphosate application. Courtesy of Nancy Swanson. As more glyphosate is sprayed, more people suffer from a host of health complications like digestive diseases and food allergies. A 2015 study found that rats who were exposed to Roundup in low doses suffered kidney and liver damage. In humans, MIT professor Stephanie Seneff found a correlation between the rise in glyphosate usage and celiac disease. Especially alarming, it has also been linked to cancer (celiac patients have an increased risk of non-Hodgkin’s lymphoma). The International Agency for Research on Cancer (IARC), a division of the World Health Organization (WHO), says that the chemical is “probably carcinogenic.” This report led to California listing glyphosate as a carcinogen under its Prop 65 law in 2016. 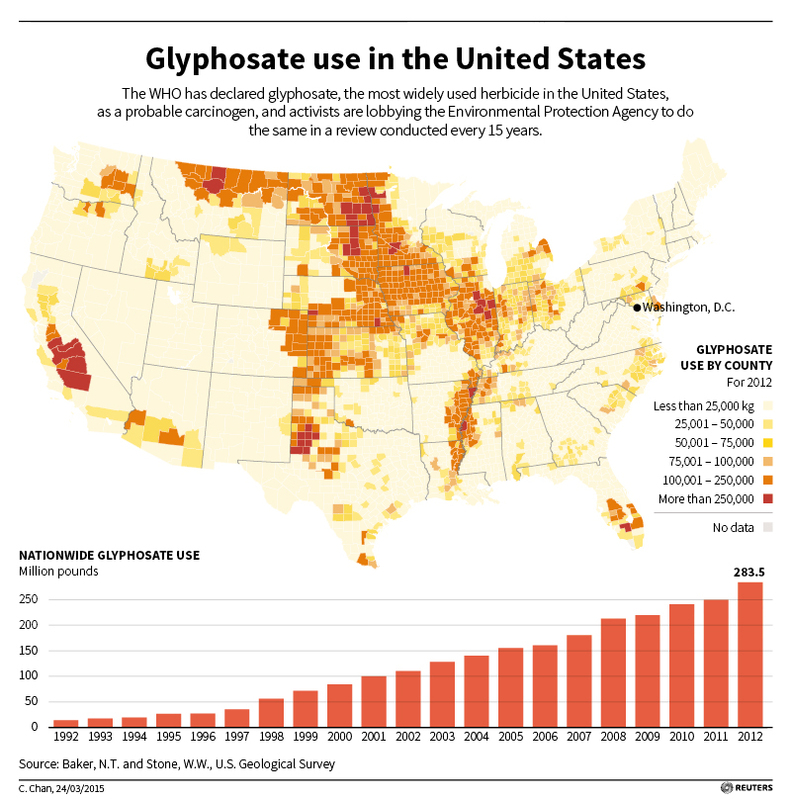 With more than 250 crop systems that use glyphosate in the state, this could lead to a significant decrease in its usage. Monsanto brought California to court, alleging that IARC’s report was inaccurate. California won the case but Monsanto continues to attack the IARC. They even teamed up with the American Chemical Council on the Campaign for Accuracy in Public Health Research to discredit the international association. The E.P.A.’s glyphosate review is expected to be released in 2017—it’s already delayed by two years. From Nebraska to Hawaiian Kona Coffee farms, hundreds of lawsuits have emerged since scientists discovered that Roundup was potentially carcinogenic. Plaintiffs allege that they regularly used the herbicide and were later diagnosed with non-Hodgkin’s lymphoma. Complaints accuse the company of more than just manufacturing and selling a harmful product. A wrongful death lawsuit filed by ClassAction.com Of Counsel attorney Robert F. Kennedy, Jr. alleges that Monsanto intentionally misinformed government agencies and the public about the safety of Roundup. “Mounting evidence suggests that Monsanto knew about the hazards posed by glyphosate exposure, but failed to disclose this information to the public,” said Kennedy. In August 2018, a San Francisco jury issued the first Roundup verdict. They awarded Dewayne Johnson, a former groundskeeper diagnosed with non-Hodgkin’s lymphoma, $289 million in damages. Kennedy is part of a legal team representing plaintiffs in similar Roundup cases. Several thousand cases await trial in state and federal courts. ClassAction.com attorneys are fighting to hold Monsanto accountable for their hazardous products. If you used Monsanto’s Roundup weed-killer and were diagnosed with a lymphatic cancer like non-Hodgkin’s lymphoma, we want to hear from you. Contact us today for a free, no-obligation case review. You may be entitled to compensation for your suffering. Did you contract cancer after using Roundup?